It looks that Irish MEPs are being given short shrift in their bid to pull any kind of accountability out of the European Central Bank over its failure to co-operate with the Oireachtas banking enquiry. It’s “a farce” says Matt Carty, confirming a meeting he and other Irish members of the European Parliament’s Economic and Monetary Affairs are to have with the President of the ECB, Mario Draghi later today. However, states Carty, “it has now been confirmed that the engagement will simply be the regular Monetary Dialogue with President Draghi whereby MEP’s will be provided with a five-minute slot in which they must put the question and receive a response from the ECB representative. “…the discussion will not even be focused solely on Ireland as previously indicated. He said, “The ECB, as an EU institution, should be accountable to European citizens including the people of Ireland. Continuing to avoid meaningfully answering questions from democratically elected representatives will simply reaffirm the growing view that the ECB feels it can act outside democratic and legal frameworks. 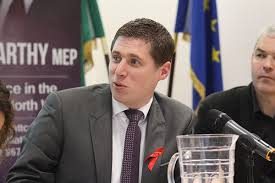 “As a member of the Economic and Monetary Affairs Committee I will use the limited opportunity to put pertinent questions to Mr. Draghi but unfortunately I fear that the responses that the Irish people require will remain unanswered after the hearing,” he added.